Ordinance Factories. Interested candidates may go through OFB official web link www.ofb.gov.in to apply for OFB Group C vacancies. Online application submission starts from 29-05-2017 and closed on 19-06-2017. Total no of number of vacancies available in OFB Recruitment are 4110 posts. Complete details regarding Ordnance Factory Board OFB Recruitment vacancies, Qualifications, Salary, Application procedure, written exam Date, Pattern and other details are given below. Click here to see the official notice of OFB Recruitment. Last date to submit online applications: 19-06-2017. Ordnance Factory Project Nalanda (OFPN): 62 posts. Ordnance Cable Factory Chandigarh (OCFC): 50 posts. Ammunition Factory Khadki (AFK): 311 posts. High Explosive Factory (HEF): 84 posts. Ordnance Factory Ambajhari (OFAJ): 219 posts. Ordnance Factory Bhandara (OFBA): 90 posts. Ordnance Factory Bhusawal (OFBH): 181 posts. Ordnance Factory Chandrapur (OFCH): 91 posts. Gun Carriage Factory, Jabalpur (GCF): 215 posts. Grey Iron Foundry, Jabalpur (GIF): 176 posts. Ordnance Factory Itarsi (OFIT): 50 posts. Ordnance Factory Khamaria, Jabalpur (OFK): 129 posts. Ordnance Factory Katni (OFKAT): 24 posts. Vehicle Factory Jabalpur (VFJ): 230 posts. Ordnance Factory Bolangir (OFBOL): 465 posts. Engine Factory Avadi (EFA): 09 posts. Heavy Alloy Penetrator Project (HAPP): 05 posts. Heavy Vehicle Factory (HVF): 292 posts. Ordnance Factory Medak (OFMK): 133 posts. Ordnance Factory Dehradun (OFDUN): 138 posts. Opto Electronics Factory, Raipur Dehradun (OLF): 160 posts. Field Gun Factory Kanpur (FGK): 179 posts. 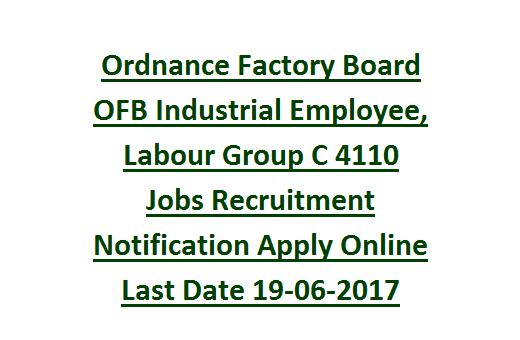 Ordnance Factory Kanpur (OFC): 499 posts. Ordnance Factory Muradnagar (OFM): 193 posts. Metal and Steel Factory, Kolkata (MSF): 125 posts. Monthly salary for OFB Industrial Employees is Rs. 5200/- to Rs. 20,200/- plus Grade Pay of Rs. 1800/- and other allowances admissible as per Central Govt rules. Candidate must have passed Matriculation with National Trade Certificate/ National Apprentice Certificate issued by NCVT. Candidates are advised to go through the OFB official notification for qualification details. Candidate should have Age limit between 18 years to 32 years as on 19-06-2017. Age relaxations permissible for SC/ ST candidates applicable as per Government rules. Written Examination will be conducted for 100 marks and consists of objective type multiple choice questions. At the time of Trade Test candidates should bring original Documents. Final Merit list/ select list will be uploaded on website @ www.ofb.gov.in. Application fee for SC/ ST/Ex- servicemen/ PWD/ woman/ Ex- Trade Apprentice is nil. Eligible applicants willing to apply for OFB Group C vacancies can get the application link from the website @ www.ofb.gov.in. Applications should be accepted from 29-05-2017 to 19-06-2017.